High uric acid levels – the hallmark of gout – can be traced to purines, substances found in abundance in rich meats, yeast and alcohol. But fructose, the simple sugar in everything from fruit juice to soda and white bread, is also a major contributor to gout attacks. When sugar is a forbidden food, it’s natural to turn to artificial sweeteners for a sweet fix, but these may be just as bad for you as the purine-rich foods you’ve vowed to avoid. Learn what sweet foods could lead straight to problems, and which alternatives are the safest and healthiest for anyone who suffers from gout. Experts have warned against too much fructose (gout sufferers should aim for no more than 25 grams a day), but artificial sweeteners pose their own health risks. Although more research is needed, many experts and sufferers with gout believe that man-made sugar substitutes like sucralose may be just as troublesome for uric acid levels in the body. The problem may be that artificial sweeteners are acidic and generally acidic foods like coffee, vinegar and fizzy drinks are more dangerous for sufferers with gout. Moreover, these chemical sweeteners are known to clash with normal metabolic processes, and since the build-up of uric acid is a metabolic issue, it’s important to steer clear of anything that interferes with your body’s ability to break down and filter compounds and toxins. Cherries and cherry juice. Recent research has shown that cherries have a powerful impact on inflammation, and a mere ½ cup each day can reduce your risk of subsequent gout attacks by 35%. Although they are relatively high in fructose, it seems that their antioxidant, anti-inflammatory, and alkaline properties far outweigh the sugar threat. Stevia. This plant-based sweetener is healthier than any other sugar substitute for a number of reasons. For one, it contains no calories. It’s also an alkaline food that does not aggravate blood sugar levels or insulin production. And since it is 200 times sweeter than sugar, a little goes a long way. 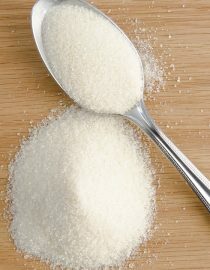 Although these are better sweetener choices, healthier alternatives may not be the perfect fix. Stevia can interfere with certain medications, and it can be difficult to monitor your fructose when you take it in the form of extracts or juice. It’s important to introduce things slowly and always run a dietary change past your doctor before adding it to your regular menu. You may want to buy some pH testing strips at your local pharmacy – they’re cheap and easy to use, and will help you maintain a healthy blood balance to ward off gout attacks. Remember, you don’t necessarily have to eliminate everything sweet from your diet, but it’s imperative that you choose the right sorts of sweet – and eat it in the right amounts. Get used to reading labels and keep a food diary to track flare-ups, which will help you to pinpoint problem foods and fine-tune your diet.